Today we were headed to Sunrise Market in the East Village to pick-up some ramen making supplies so we finally got to try a restaurant that's been on my list for a long time now: Shabu-Tatsu. We've never had hotpot before Japanese or otherwise, so this was an exciting new adventure for the Newbie Foodies. We started with a lovely bottle of unfiltered sake and settled in to see where the meal would take us. Being a huge ramen fan, I'd been hearing great things about Yuji Ramen located in the food court on the 2nd floor of Bowery Whole Foods. However, I had also heard it was a temporary pop-up shop, so I wasn't even sure if it was still there. I did hear that they were opening a second location in another location in Williamsburg though, so figured it was pretty likely. We needed to go shopping (for ramen ingredients no less) at Whole Foods so decided to find out. We've been on a bit of a French food kick since The Mr recently had the breakthrough that French food is not just hoity-toity food, but in fact buttery, culinary goodness. We were looking for a new French Bistro to try so I set out on The Googles and finally settled on Chez Napoleon. I was a bit nervous, because it had some very mixed reviews, but after reading through them, I felt like I had a pretty good picture of what kind of evening we were in for. The Mr. has been on the quest to make the perfect Eggs Benedict so we wanted to try the best so we had a bar to strive for. 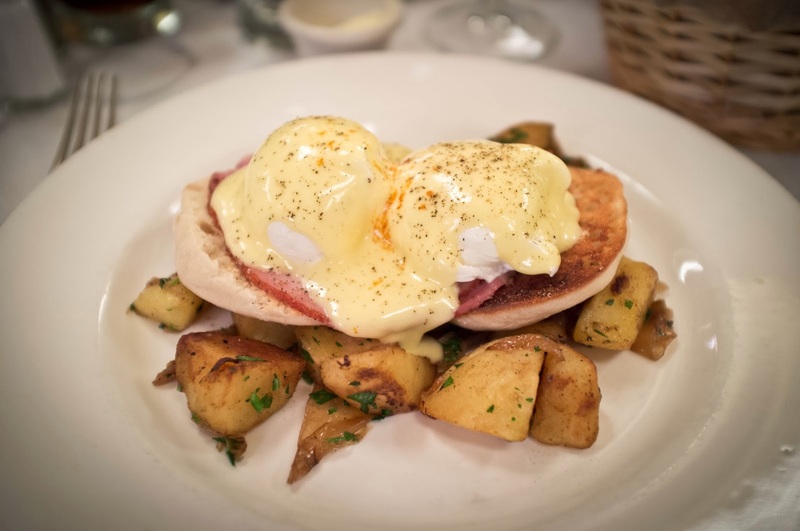 I consulted with the internet and decided that Balthazar would be the best bet for a traditional eggs benedict done right. We were headed to the Booth Theatre to see The Glass Menagerie tonight, so wanted to try a new Pre-Theatre spot in Hell's Kitchen. One of our 2014 goals is to try to knock out more NYC Michelin starred restaurants so decided to try out modern Korean 1-starred Danji. The Mr. started with the Su Jung Kwa cocktail which featured rye whiskey, cinnamon, ginger, & jujube and I started with the "Korean Pear" with vodka, star anise, & cinnamon. The meal was off to a great start because these cocktails were both super delicious. I was initially excited to try the "Perfect Date" as my next drink, but was so enamored with the "Su Jung Kwa"'s cinnamony warmth that I abandoned that and we ordered another round of those. Did you know there's a Grimaldi's outpost in Kips Bay? We sure didn't! That is until today when we went to see The Hobbit: The Desolation of Smaug with a couple of friends at the Kips Bay movie theatre and they suggested grabbing some pizza for lunch. "Sure!" I said and started heading West assuming we were headed to Limelight Marketplace. "Where are you going??" said my friend as he started heading South on 2nd Ave. I tend to keep up on NYC food news so was really surprised this slipped under my radar. It's been quite a while since I originally posted about Doughnut Plant, so just wanted to do a quick update post that this place is still our favorite doughnut place in NYC and one of our favorite treats. Paired with a cup of Joe's Ethiopia Coffee this duo makes the perfect weekend morning in. Special shout out to the special Holiday Marzipan Yeast doughnut. Mmmmmm....doughnuts. 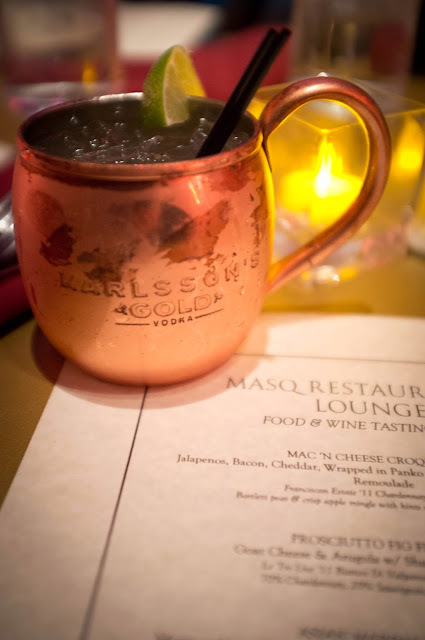 I was invited to try a tasting of the offerings at MASQ a New American restaurant with a distinctive New Orleans flair. 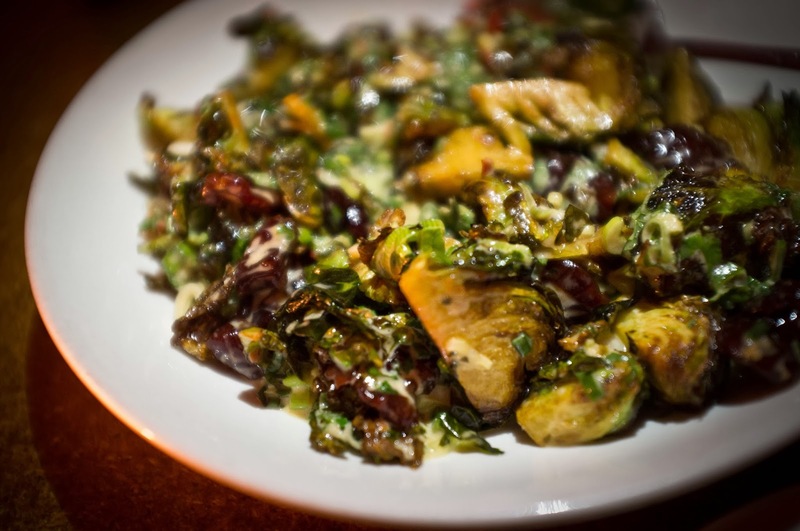 The restaurant is a collaboration between a husband and wife team and Chef Marc Getzelman. Their love of NOLA is reflected in the decor of the floor-through layout which features a horseshoe shaped bar in the front, the dining room, lounge, and private party room in the back. OK folks, I was traveling light for this mini-bar crawl which means iPhone pictures in very dim lighting. However, unlike these photos, the quality of food/drinks we enjoyed were top notch. The backstory is that we had tickets to go see Then She Fell, an immersive theatre experience at Greenpoint Hospital. This was actually our second visit and last time we had dinner in Manhattan before heading out to the area, but passed so many really neat looking bars on our way. We only had time to head into one for a quick drink and decided we were really missing out by not exploring this neighborhood. I was pretty excited about the opening of Gotham West Market, since well, 11th Ave is pretty much no-man's land at the moment. 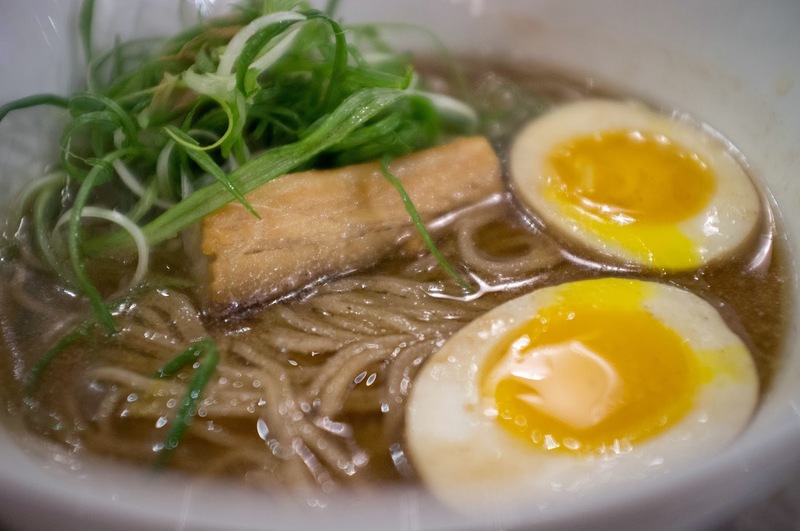 But then we got pretty darn excited when we learned that it would be home to Ivan Ramen Slurp Shop. We'd seen Ivan Orkin on "Mind of a Chef" and couldn't believe that we'd have an outpost within a mile of our apartment. The Mr. continues his adventures in ramen cooking with this, his latest masterpiece using a pork belly based broth.